In 2004, the U.S. Food and Drug Administration issued an official guidance on process analytic technology (PAT), to encourage its voluntary adoption as a means of achieving quality by design (QbD). 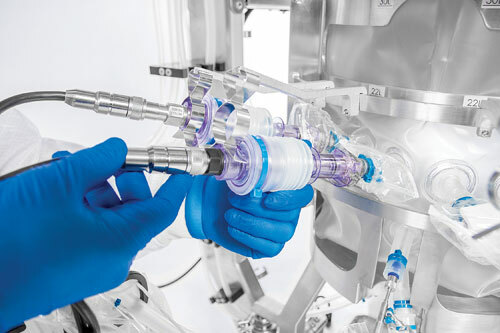 In theory, PAT and related instrumentation facilitate the design and development of well-understood and -controlled manufacturing processes resulting in predefined product quality. “PAT methods may form part of a QbD approach to the development of bioprocess control strategies,” says Nick Hutchinson, Ph.D., technical content manager for bioprocess solutions at Sartorius Stedim Biotech. For example, the integration of in-line biomass sensors into single-use bioreactors leads to enhanced monitoring and control strategies while in-line disposable UV sensors can monitor protein concentration to support control of downstream ultrafiltration steps. Scientists at Amgen have recently shown how the collection of chromatography pools based on purity measurements via online HPLC helps prevent lot rejection. Similarly, monitoring of nutrients and metabolites in cell cultures allows for the fully automated control of glucose feeds in real time by connecting the analysis system to local automation such as programmable logic control (PLC) and supervisory control and data acquisition (SCADA) systems. More sensors equals greater complexity and, inevitably, more information streaming from processes to analysis and control systems. Multivariate data analysis techniques help make sense of bioprocess data generated across scales, and converts that information into process knowledge and understanding. Bioprocess engineers must be able to retrieve data reliably from both miniaturized experiments (for example, from the Sartorius ambr® systems and others) that today’s developers use to define design space and to predict performance of process runs at intermediate to commercial scales. Single-use sensors are built into disposable process containers, which together are gamma-irradiated and delivered to the customer as a sterile system. Challenges for single-use sensors include reliability, standardization, and consistency. According to Thermo Fisher Scientific, a producer of single-use sensors, research into quality gaps could help to deliver an ideal product to the market. At-scale operation, however, has been an issue, although some advanced sensing modalities are breaking through. Capacitive biomass sensors from Aber Instruments have been adopted or evaluated by most of the large biomanufacturers, from development through cGMP production. But Aber's commercial capacitive biomass system, Countstar, is marketed only to breweries in South America, according to Aber’s marketing director John Carvell, Ph.D. Sensors that reliably operate across scales, including “design of experiment” (DOE) volumes of parallel micro- and mini-bioreactors, will become increasingly relevant. For example, Aquila Biolabs’ Cell Growth Quantifier for microbial fermentations measures biomass in specially designed shake flasks. The system uses an optical sensor that reads cell density through the bottom of the flask. Conventional biomass measurements employ lengthy manual sampling and photometric optical density measurements. Even simpler is a handheld biomass sensor from BugLab, which according to company literature measures cell density in six seconds at up to 30 optical density units. For cell culture biomass determinations, options include the Countstar system from Aber (and sold by Applikon Biotechnology). The company has published data showing a greater than 99% correlation between Countstar measurements and conventional determinations of CHO biomass through hemocytometry. Countstar is also available for microbial cultures. Other companies, including Hamilton (through its acquisition of Fogale Nanotech), provides sensors suitable for measuring viability of small-scale cell cultures used in biomedical research. Measuring intermediate metabolites or substrates on which cells grow are gaining importance as well, since controlling these parameters lead to higher quality and greater yields. Many sensing technologies have emerged but are of little use without demonstrable robustness at production scale. In that regard sterilization remains a barrier for in-process sensors, and noninvasive sensors are highly desirable. Interoperability between disposable sensors and fixed-tank bioreactors is still limited, even though it would offer several advantages. Besides lowering overall costs and enhancing flexibility in operations, such interoperability could facilitate the cross-platform transfer of PAT-related practices. An advocate of such interoperability is Surendra Balekai, senior global product manager, Thermo Fisher Scientific. He has argued in favor of standardizing single-use sensors and developing the means to apply them to stainless-steel bioreactors and fermenters. In the August 2016 issue of GEN, in an article entitled “Plastic or Steel, Bioreactors Aim to Put Quality First,” Balekai pointed out that single-use probes could, in principal, be used in fixed-tank systems. In most cases, however, they lack the appropriate physical dimensions. Making them fit would require reworking the bioreactors’ steam-in-place (SIP)-tolerant plastic ports, and demonstrating equivalence for the sensors themselves. 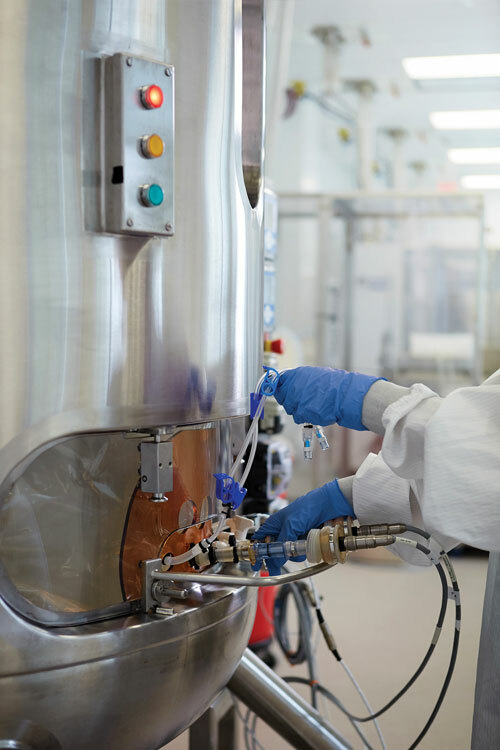 This image shows the installation of probes and tubing on the Xcellerex bioreactor, a single-use stirred-tank platform manufactured by GE Healthcare Life Sciences. The company notes that sensing technologies should demonstrate robustness at production scale to ensure they contribute to higher quality and greater yields. Underdeveloped standards, limited interoperability, and questionable reliability—these adverse factors tend to dampen enthusiasm for PAT and QbD. Nonetheless, PAT and QbD are often featured in conference programs and trade publications. For example, Chantal Cazeault, the executive director of product quality at Amgen, has spoken on the need for PAT in continuous processing (itself a worthy topic), noting the lack of “guidance specific to continuous bioprocessing.” Many similar presentations have been delivered by experts affiliated with best-in-class companies. One wonders, however, about the true depth of interest among rank-and-file companies, whether innovation has actually trickled down to them from leading companies. In theory, these initiatives improve process understanding. In practice, their investigation and deployment may impose resource costs that are unlikely to be recouped. Although some savings may be realized, they may not even matter due to “perfection pricing” for biopharmaceuticals. Bioprocess understanding would at least be more approachable if sensors were more reliable and their readings more reproducible across scales. “Scalability and consistency at different scales remain issues,” Balekai observes. Single-use technologies are already enjoying significant adoption in downstream processes. Presumably, these technologies are helping to satisfy production demands, which include reliability and the implementation of PAT. Still, agreeable single-use trends could be reinforced with the development and implementation of better sensors. Ideally, manufacturers would strengthen their regulatory status by clarifying production hurdles and identifying process efficiency and quality gaps. “But you still have to work at it,” Balekai insists. In bioprocess sensing, two of the more critical parameters are pH and oxygen. “Online measurements of these two parameters allow control of culture conditions, and provide an excellent overview of culture status and performance,” says Gernot John, Ph.D., director of marketing and innovation, PreSens. Optical sensors are gaining greater significance in bioprocess monitoring. For example, in the monitoring of oxygen levels, bioprocessors are replacing Clark-type electrodes with optical sensors. Optical sensors are also being used more frequently in the monitoring of pH, if only in selected applications. “Optical pH measurement,” observes Dr. John, is “primarily utilized in single-use systems where it offers contactless pH monitoring.” In general, however, optical sensors are unlikely to overtake classic pH electrodes, which provide a much broader measurement range. Optical sensors are also becoming more attractive through systems integration efforts. For example, it has recently become feasible to connect optical sensors to standard controllers through conversion devices such as the Optrode Dual from PreSens.